The guidebook said we should set off close to sunset and climb in the twilight. So that is what we did. We got off the bus at St Catherine’s monastery, allegedly near the burning bush Bible story. I like that the earliest record of the place is from a 4th century female traveller – Elegia, I salute you and your travel journal tradition. We had a small pack with us, mostly containing water plus some warmer clothing for the overnight at the top. The walk up was heavy going at first in the searing heat, but as we lost the sun and gained altitude it became easier. I was still surprised though when my companion complained of the cold. We stopped for a water rest and realized the cause of the problem. The water bottles were mostly empty. And the warmer clothing mostly soaked. A bad combination but too late to cry over. We pressed on and reached the top just as it was becoming too dark to see. There were 3 other people on the top. And, of course, a man sitting cross-legged with a small gas stove selling mint tea. Did he come up every night we wondered? Carrying his equipment and enough water for his estimated number of tourists and pilgrims. Presumably it was worth it though it was hard to see how the maths would work. We looked around the mountain top for a suitable place. I’m not sure what we thought we might find – a queen sized mattress under a rock maybe? At least we found a flattish piece, reasonably free of uncomfortable ridges. As budget travellers (10 days in Egypt on $200) we had not brought sleeping bags, let alone anything to cushion the unforgiving rock. But still it was more comfortable than the previous night which we had spent on a bench in Suez bus station – not the most peaceful place to sleep. 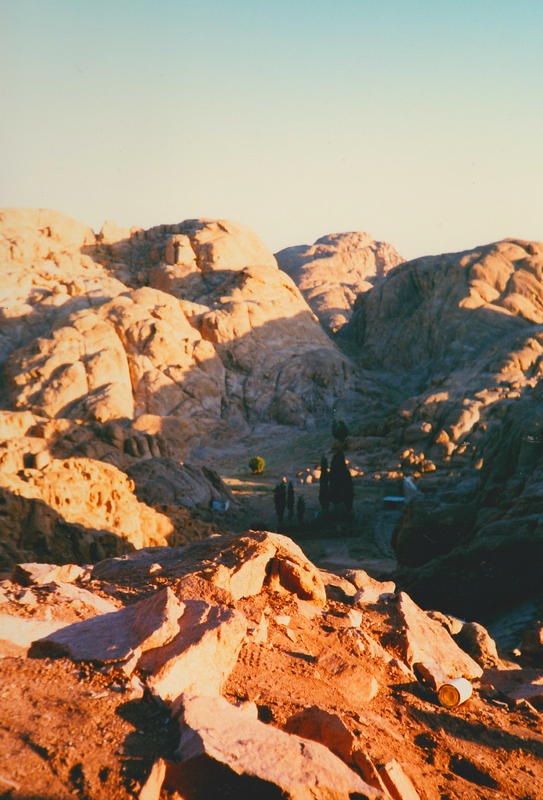 Nonetheless, that night on Mt Sinai was long and cold and rocky. I dozed fitfully, vaguely aware of other travelers around me. In fact when it started to get light in the morning I was amazed to see at least a hundred people up there. As the sun broke over the horizon, the grey landscape sprung to life. Rich colours rocketed across the horizon, long shadows bruising the red rock and pointing fingers at surrounding mountains. As far as we could see in any direction there was no sign of civilization, here in the heart of some of our most ancient civilizations. Just this small tribe gathered on a mountain top, united for a moment in honour – variously – of Moses, the sun, the wonder of our planet, their own achievement at being here. Like most minor struggles it had been more than worthwhile. The memory of that sunrise has stayed with me far longer than the discomfort of the night.